Above is an ariel photo taken by Whites Aviation in 1956, one of a number in the poccession of the writer, The Kaipara Hospital is clearly evident in the foreground, the "Old Mens Home" had yet been relocated to the hospital site and can still be seen centre right. Norton Street can be seen running parallel to the river, the aptly named Hospital Road is to the right and in the lower right hand corner can be seen the apparrently overgrown hospital gardens. A 'paper' road continues down past the hospital to join up with Norton Street at the foot of Te Kopuru Hill, the road was never formed and was used mainly for the moving of stock to and from winter run offs, thus avoiding the main town centre. Many visitors to the district and those passing through cannot fail to notice some of the mounds and peaks in what the otherwise flat and low lying land around the river. The obvious ones are the core of the old volcanic cone of Toka Toka 580ft on the eastern bank of the river and further north Maungaraho 720ft. Less obvious is the area known as Green Hill, on the opposite bank, used to exhaustion in the early days by the Hobson Council for the extraction of roading metal and now a hill in name only, known by local Maori as Motu Wheteki. Not far from Green Hill there is a long shaped rock a short distance from the bank of the river, this is called Okiriahi. A little further down on the opposite bank is a green mound called Kewi Pahutei. Legend has it that 5 brothers called Maungarahu, Tokatoka, Motu Wheteki, Kewi Pahutei and Okiriaha travelled from the East coast to the West coast beaches to gather toheroa, a local shellfish. When they reached the river they had problems crossing, Motu Wheteki got across with difficulty and landed at Green Hill which now bears his name. Okiriaha got nearly across but was drowned at the spot that now bears his name, the others were grief stricken and failed to cross or to return home. 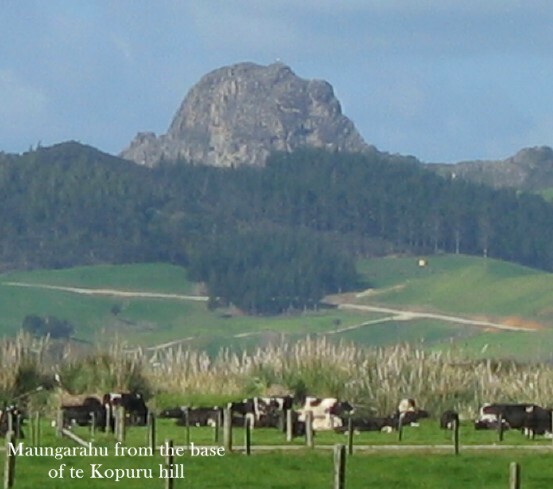 The writer came to Te Kopuru in the early 80's as joint owner with his wife of the local dairy, even at that late stage a number of commercial enterprises still traded, all have now gone. As well as the dairy there was a Four Square and IGA store, a service station, a pie shop very succesfully trading throughout the district and beyond, a general workshop catering mainly for the rural and farming industry plus of course a post office (Remember them?). The dairy has had a long history, it started life as a bakery which was moved from the nearby township of Aratapu in about 1943 and the bricks from the old oven were used in a house which still stands alongside the entrance to the Te Kopuru Domain. One of the locals now long gone who lived in the aforementioned house recounts his expeditions delivering bread to the locals on a push bike. As I suspect most of the roads would have been loose metal it sounded like a dangerous occupation. 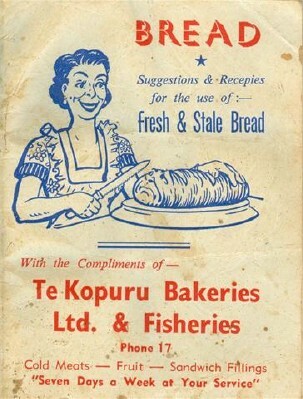 The bakery appears to have been converted to a bakery and fish shop at some stage, the Companies Office have records of 'Te Kopuru Bakeries' which traded as a limited liabilty company from 1950-1961. I have this little booklet in my possesion which must have been produced during those days. As mentioned 7 day trading saw the local supermarkets open and the cheaper prices that were available to them made the dairy no longer profitable so it was subsequently closed. For a short period a sewing factory was run from the premises employing at it's peak 7 staff (including the writer) however changes to the import duty on clothing made this unprofitable and the short lived project was forced to close. Many of the local buildings in the village have disappeared over the years, some in the early days fell victim to fire, some lingered on unoccupied and had to be demolished. Many others, including all but one of the churches have been moved and put to different uses. 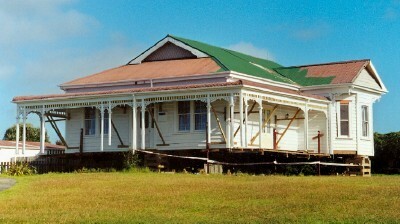 The one shown below which was located opposite the Te Kopuru Dairy on Norton Street, was moved and is now located at Bayleys Beach. It was originally the home of the manager of one the many timber mills located alongside the river, it was in a sad state when it was moved and has been faithfully restored by its new owners.